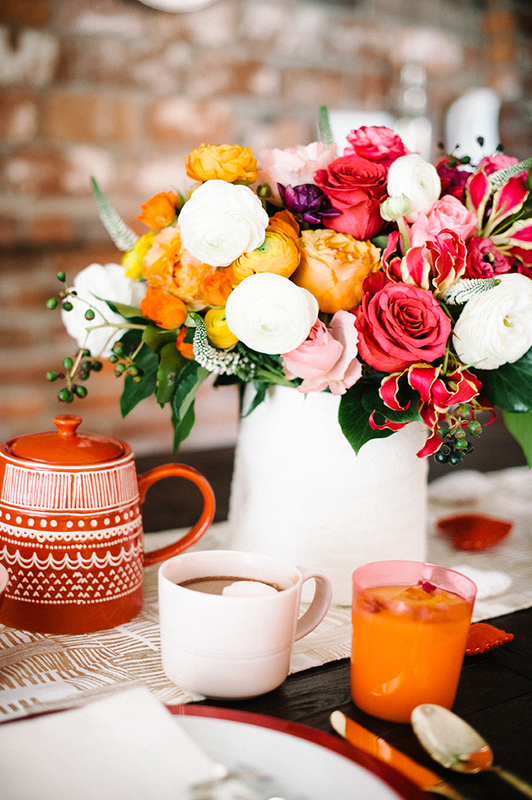 No V-day is complete without flowers. Aside from the typical arrangement, I wanted to bring some in the bedroom! 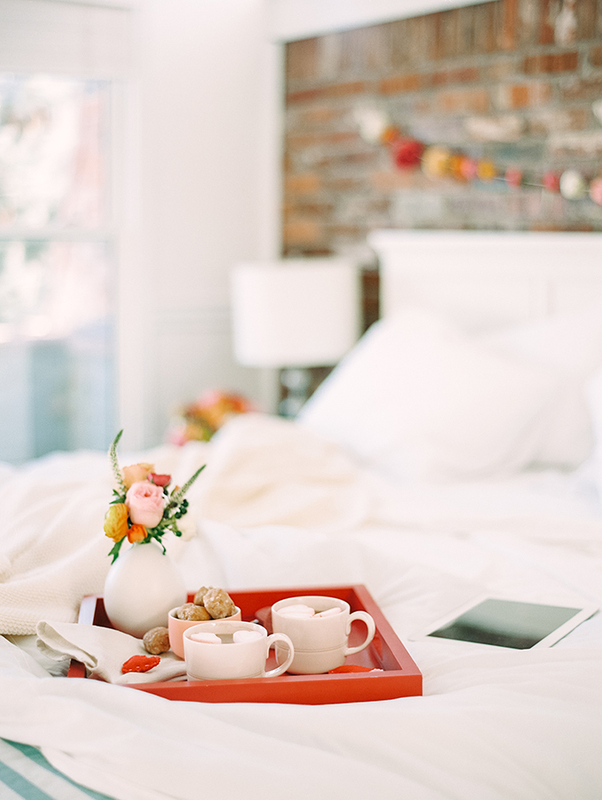 I love petals on the bed and the floor, but I’d much rather have blooms hanging over my head! 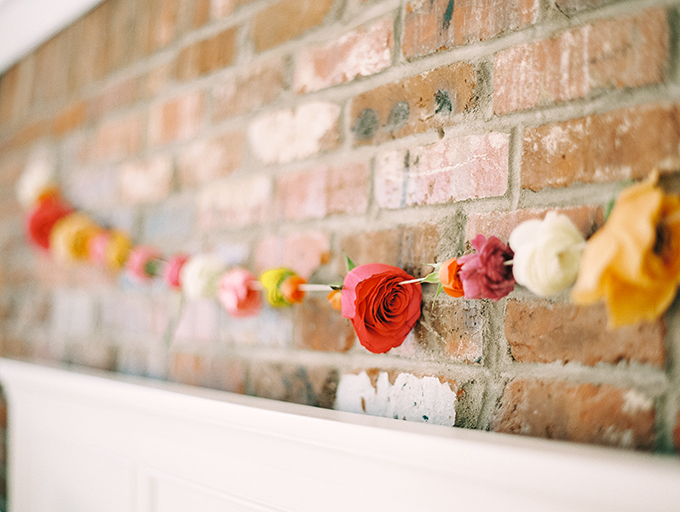 There are TONS of ways to bring flowers in to decorate with, but a simple garland was just the ticket today. We used some stunning flowers courtesy of Flower Muse and threaded a garland made of roses, ranunculus, and a few pieces of White Veronica! 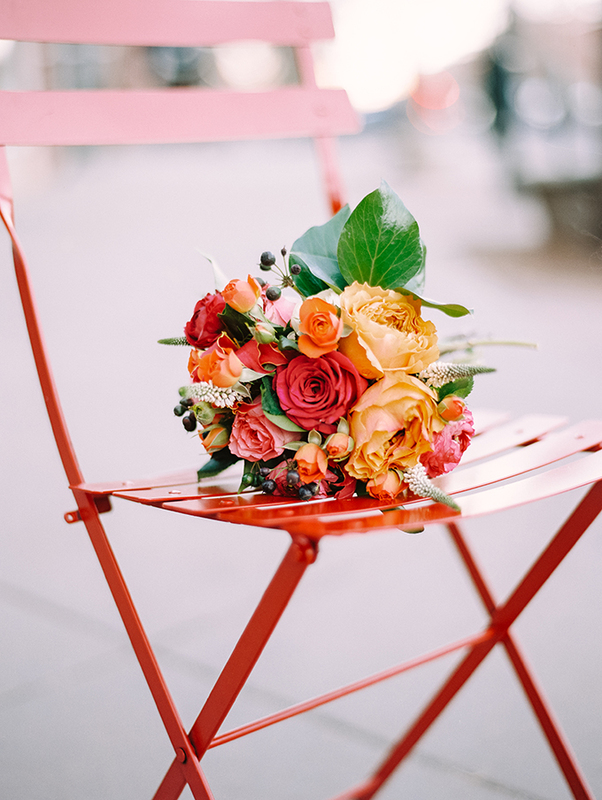 To make your own, gather an assortment of flowers and cut the stems off. Cut as close to the bottom of the flower head as you can while making sure that the flower will still be stable. Using an embroidery needle, thread some twine through each flower head alternating the color, flower, and direction of each blossom. 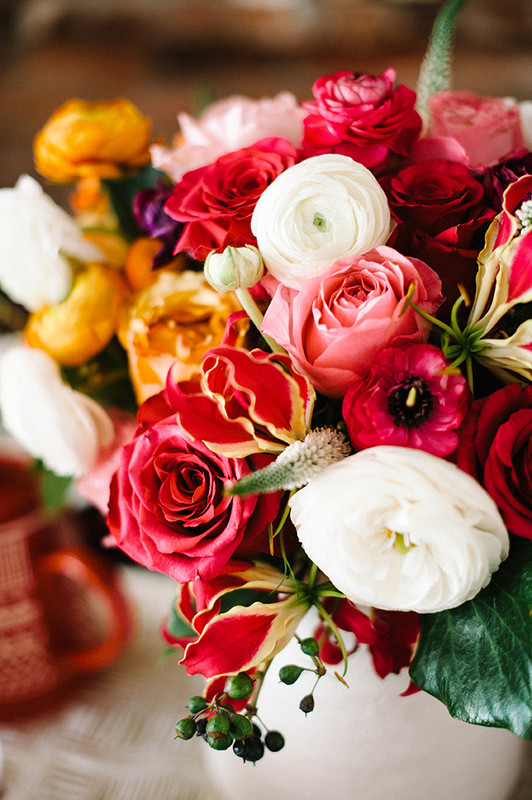 Work gently as flowers are still delicate, but they’ll be able to hold up to being threaded. Once you’ve reached your desired length, trim the ends of the twine and attach to the wall with some Command clear decorating hooks! It’s only appropriate to start the day off with donut holes. You just have to. It doesn’t even have to be a holiday. Okay? Just…do it for me. OH my gosh, they’re just so cute. 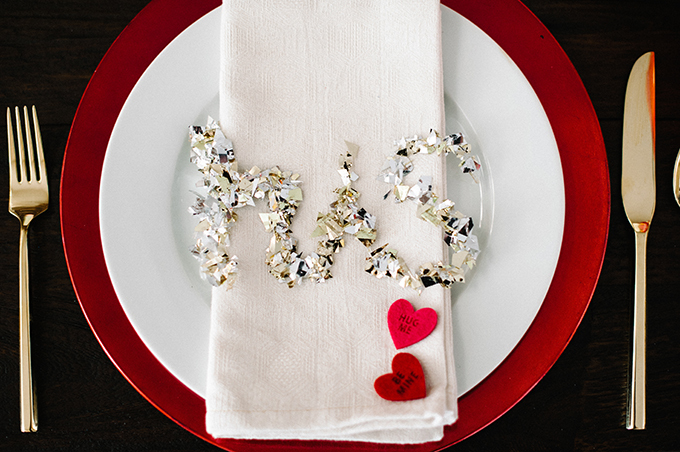 Plates were decked out with “his” and “hers” confetti tags. These were one of my favorite aspects of the day! To make your own, write out a letter at a time in hot glue. Before the glue has set, sprinkle it with a little confetti! I worked in small 2-3″ segments alternating the gluing and confetti-ing. Let them set and then lay out over each napkin! 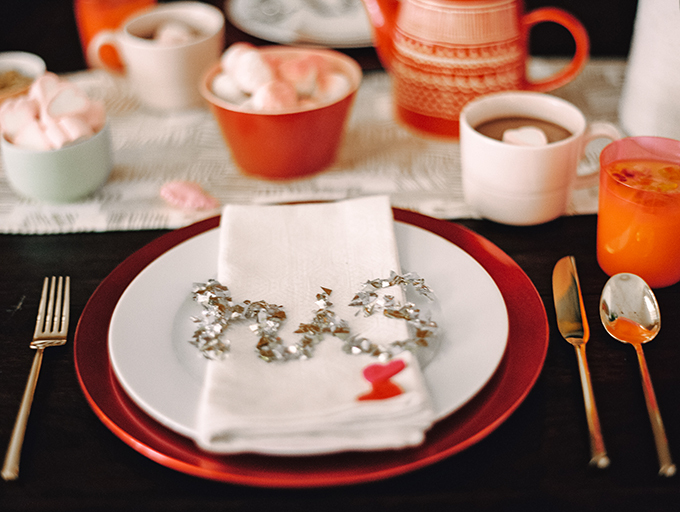 If you’re feeling a little overwhelmed, make initials for your guests rather than whole names or words! Everybody wins! 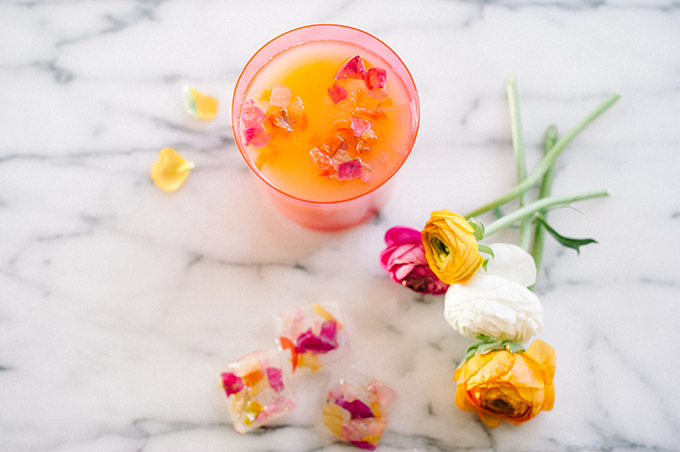 I shared these floral ice cubes over here a few days ago! They pop against the OJ, you guys. 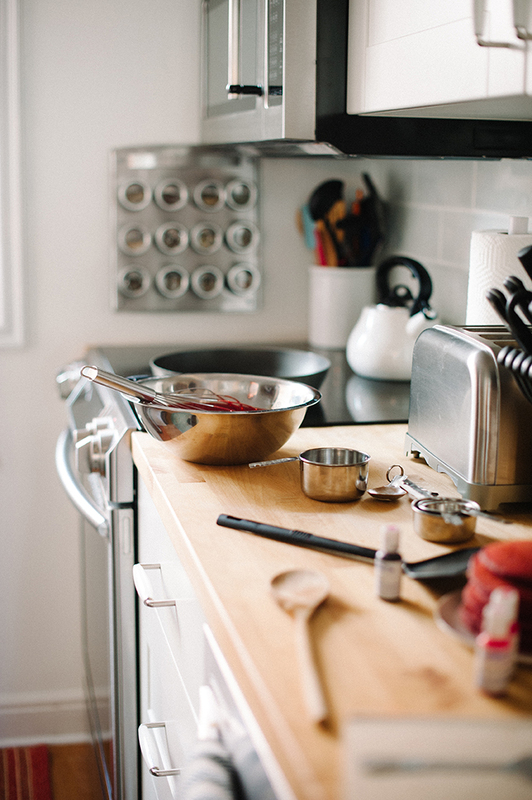 Take a few minutes and pop over to 100 Layer Cake to see more and get links to all the goods in the photos, okay?! My Valentine’s Days are usually filled with trips to McDonalds for a 20-piece, so this is definitely classin’ things up! 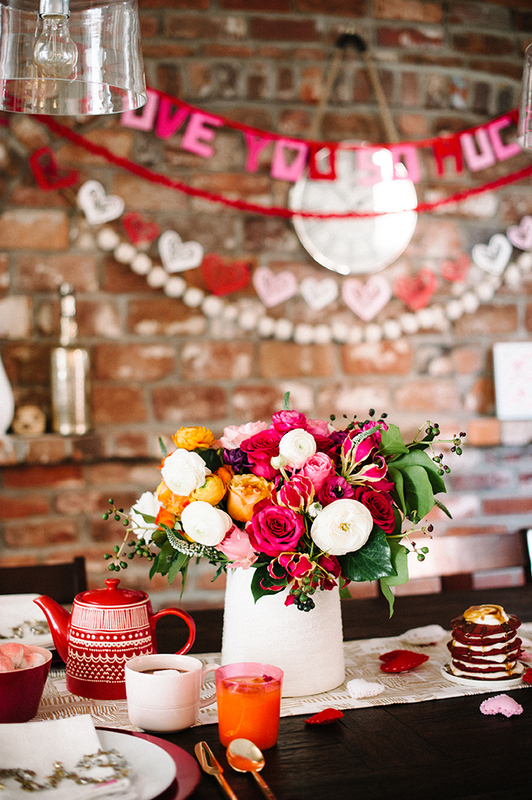 Check out the entire gallery of the V-day shoot here! 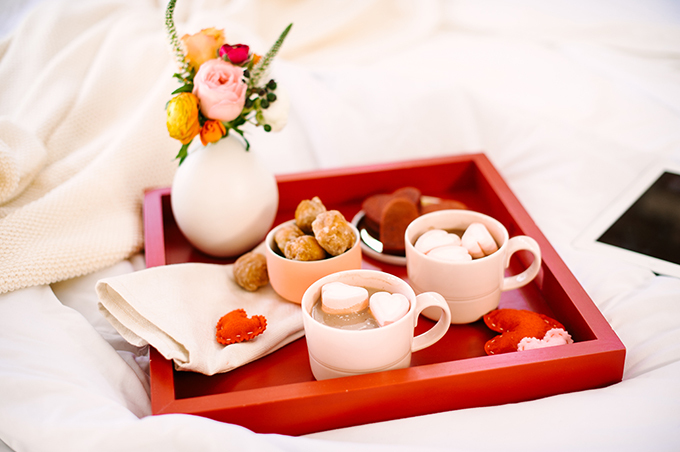 Check out all sorts of Valentine’s Day DIY projects here! Wow! What a special day! 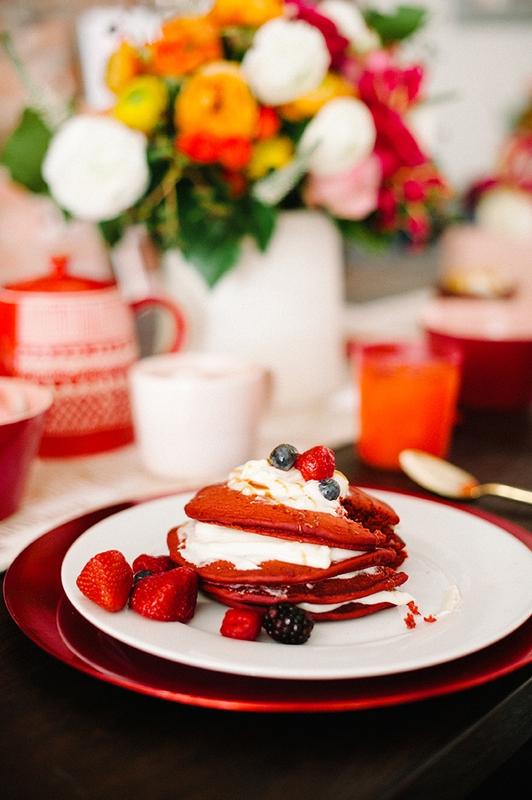 Do you think you could share the recipe for the pancakes? I’ve only made them once before and they were disgusting. My kids would love these! Stacey! Girlfriend! 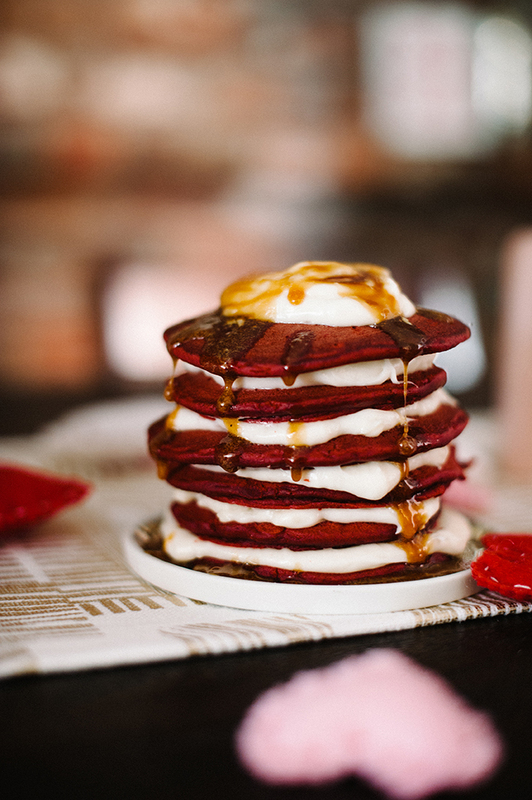 We used this recipe found here – http://www.cookingclassy.com/2012/12/red-velvet-pancakes-with-cream-cheese-glaze/! Adorable! The photos look so gorgeous and loveable! 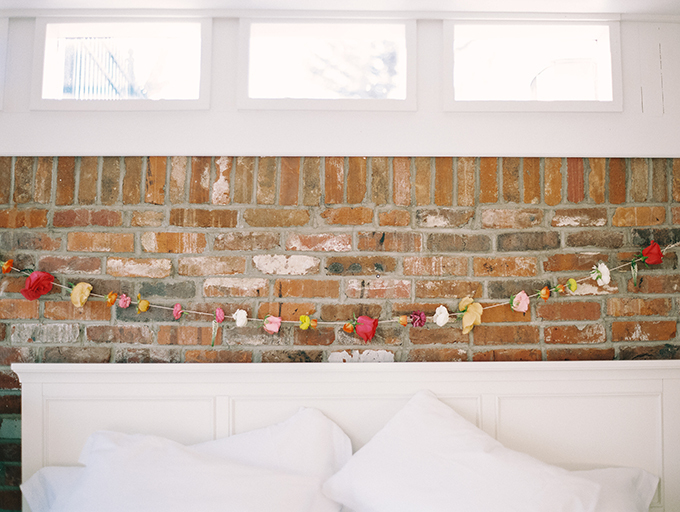 I adore the flower garland! Thanks, Monique! The flower garland is my fave as well! Michele did such a great job with the photography! What a talent!!! this is my favourite valentine’s shoot. hope you had a happy love day! This shoot is stunning, Lex!!! So beautiful.